I remember the first time I heard of the word vicuna is actually from Sunset Boulevard (the musical). I have no idea what it is. I thought to myself "Is it some kind of mysterious fabric?" Well, it is sort of a mysterious fabric. It's basically a kind of alpacas wool.... very soft and warm (softer and denser than cashmere); higher grade cashmere if you will. These vicuñas are only found in South America. During the Inca empire days, only royalties get to wear vicuña wool. These wool are also treasured because of their rarity. Each vicuña only produce about 250 grams of hair every two years; compare that to cashmere goat which produces 500-800 grams. It takes about a fleece of 25-30 vicuña to make one coat. Currently there are over 123 million goats in China alone that produce cashmere. In comparison, there are only about 350,000 vicuñas in existence. Because of the rarity and because you can only shorn a vicuña every two-three years, this particular wool is ultra expensive. Like everything rare, there are illegal shearing of these animals. And of course there are the legal ones. One of such company is Loro Piana. You know, the one who brings you super luxurious cashmere! Well, it should be no surprise to anyone that they bring you vicuña fabric as well. 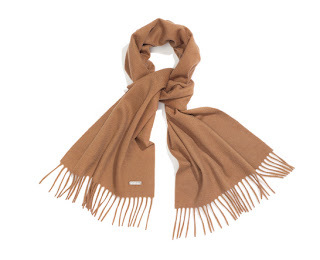 They make a variety of garments using vicuña fabric: throw blankets, scarves, coats, capes, etc. You can all find it here. But be warn, price tags are not for the faint of heart.